All computer software which has been built from the platform level requires infrastructure. Software as a Service (SaaS) where by most SaaS applications can be run directly from a web browser without any downloads or installations required, eliminating the need to install and run applications on individual computers. Popular SaaS include email and collaboration, customer relationship management, and healthcare-related applications. Platform as a Service (PaaS) is the framework where developers can build upon to develop or customize applications. PaaS makes the development, testing, and deployment of applications quick, simple, and cost-effective. Infrastructure as a Service (IaaS) are self-service models for accessing, monitoring, and managing remote datacentre infrastructures. Rather than having to purchase hardware, users can purchase IaaS based on consumption, similar to electricity or other utility billing. 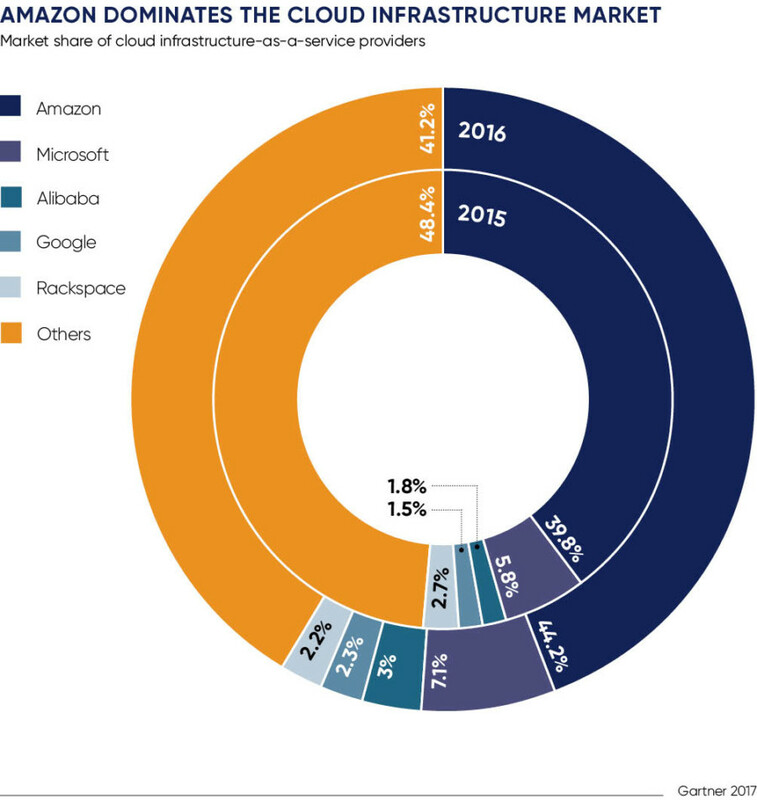 Research on finding the leading providers of cloud services by Helen Beckett concluded that, Amazon Web Services and Microsoft’s Azure are the comprehensive leaders, predicting that both Amazon and Google will capture 76 per cent of all cloud revenue in 2018, and expand its share to 80 per cent by 2020 (Beckett, H, 2019). This intern causes a major paradox, we are currently building a decentralised system on a centralised infrastructure. Therefore, increasing the reliance on centralised services which overthrows the main objective of decentralization.